Book by James Lapine, suggested by the painting A Sunday Afternoon on the Island of La Grand Jatte and the life of Georges Seurat. Music and lyrics by Stephen Sondheim. The original Broadway production opened on 2 May 1984 and was directed by James Lapine. The production closed on 13 October 1985, running for a total of 604 performances. A DVD production of the Broadway show has been released. In 1884, an artist sits before a huge empty canvas (the stage) with his sketch pad: “White. A blank page or canvas. The challenge: bring order to the Whole Through Design. Composition. Tension. Balance. Light. And Harmony.” As he speaks, the canvas becomes a park on the Isle of La Grande Jatte. George is sketching his free-spirited mistress, Dot, who is finding it difficult to comply with George’s demands (SUNDAY IN THE PARK WITH GEORGE). Moments in the park magically transform into great works of art: rowdy boys bathing on the banks of the river, become, with a sweep of George’s hand, become the painting Bathing at Asnieres. At an art gallery, Jules – a rival artist and supposed friend – comes by with his wife Yvonne and they critique the work (NO LIFE). Back in the park, George is finishes up his work on Dot, promising her they will go to the Follies that night. She leaves and George continues his sketching, chatting with an old lady and her nurse. The old lady is George’s reluctant-to-admit-it Mother. Later, in George’s studio, Dot gets ready for the Follies as George works on his large canvas (COLOR AND LIGHT). George angers Dot when he tells her he can’t go to the Follies because he has to “finish the hat” and Dot storms out. Time passes and, back in the park, George is sketching a rough boatman. The nurse and his mother are also back and the two Celestes GOSSIP. Dot enters with a new man in tow – Louis, the Baker. Dot is learning to read and proudly studies her lessons as George approaches. They exchange a few tentative words but George retreats as Louis comes to fetch Dot away. George begins sketching the Boatman’s dog and all give their insular perspectives on THE DAY OFF. Dot returns but George leaves as he sees her approach. She calls after him, declaring how lucky and happy she is now (EVERYBODY LOVES LOUIS). The relationships and interaction in the “picture” becomes more detailed and complex – for example, the two Celestes flirt with two soldiers. Later, on his own, George considers his days work and, thinking of Dot, tries to express what it is that drives him as an artist, even as he yearns for a human bond with someone who could accept him (FINISHING THE HAT). Suddenly the park is alive with people again and Dot approaches George – she is pregnant. In George’s studio, the artist works. Dot arrives and they argue, each full of recrimination, yearning and regret. They are interrupted by the arrival of Jules and Yvonne. Jules is there to look at the progress of George’s work. His response is unfavorable. When Jules and Yvonne leave, George and Dot conclude their discussion (WE DO NOT BELONG TOGETHER). Dot leaves, telling George she has to “move on”. Back in the park, the George’s mother is unusually tender with him (BEAUTIFUL). More people arrive in the park, including Dot who comes on with her baby daughter, Marie. She tells George she is going to America. George will not look at her or the baby, as they speak, denying that the baby is his. Dot leaves, and George calls after her that he is sorry. All the characters come into the park, interrelating and fighting. The noise and movement build to a loud, unpleasant swirl until George stops everything with a gesture and carefully, powerfully, assembles the mass into the order of the painting “A SUNDAY Afternoon on the Isle of La Grande Jatte”. Dot is in the painting too – right in front, as the first act comes to a close. The second act begins with the same tableau. Everyone in the painting is complaining (IT’S HOT UP HERE). Suddenly, a century has passed and we are in the U.S., at an exhibition of the painting where another artistic George is showing his newest work, a laser-light “sculpture,” Chromolume #7. This George is Seurat’s great-grandson, and he is here with his wheel-chair bound, 98-year old grandmother, Marie (Dot’s daughter). The party is filled with critics and other artists, all with something to say about young George’s work. George tries to keep control of the situation and placate everyone (CHROMOLUME #7 / PUTTING IT TOGETHER). When all the guests are called in to dinner, Marie is left in front of the painting while George and his amicable ex-wife, Elaine, talk. Marie is in a half-dream state, looking at the painting. She begins to speak to Dot’s image, seeing her mother everywhere on the canvas, and she expresses her love and concern for her unhappy grandson (CHILDREN AND ART). George joins her, and Elaine wheels her off, as she looks back at the painting saying goodbye to her mother. From left to right above: 1. Sunday in the Park With George Original Broadway Cast CD (Remastered with Extra Tracks). 2. 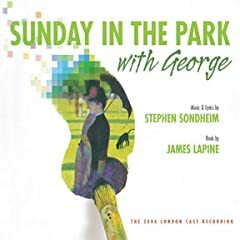 Sunday in the Park With George 2006 London Cast CD. 3. Mandy Patinkin Sings Sondheim CD, with songs from Sunday in the Park With George. 4. 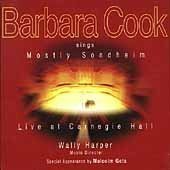 Barbara Cook Sings Mostly Sondheim CD, with songs from Sunday in the Park With George. 5. Sondheim: a Celebration at Carnegie Hall CD, with songs from Sunday in the Park With George. From left to right above: 1. Sunday in the Park With George Original Broadway Cast DVD. 2. Sondheim DVD Collection: (Into the Woods/Sunday in the Park with George/Follies in Concert/Passion/Sweeney Todd in Concert/A Celebration at Carnegie Hall). 3. Sunday in the Park With George Book. 4. Sunday in the Park With George Vocal Selections. 5. Sunday in the Park With George Vocal Score.